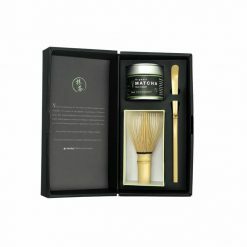 The Artisan is a luxury organic matcha gift set that includes handcrafted tea implements and is made in your matcha style. Feel the modern tradition of organic matcha from HealthyTOKYO. 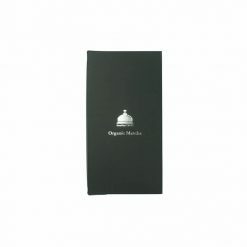 The Artisan is an organic matcha gift set featuring No. 1 Ceremony, the finest organic matcha in Japan. The contents of this luxury organic matcha gift set are all Made in Japan. 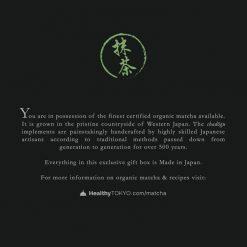 All the premium matcha from HealthyTOKYO is certified organic by Japan Agricultural Standards (JAS) and grown in the serene hills of Western Japan. No. 1 Ceremony is ceremonial level matcha. It is stone-ground from the youngest leaves. It is a vibrant green with a delicate taste and fine texture. The matcha implements – the chashaku and chasen are all handcrafted in Nara by the 20th generation of craftsmen that have been doing so for over 500 years. The Artisan is specially designed for authentic Japanese Tea Ceremonies. Perform Sadô with handcrafted implements steeped in history. The Artisan is a beautiful gift and souvenir for anyone with an interest in Japanese culture, history and food.